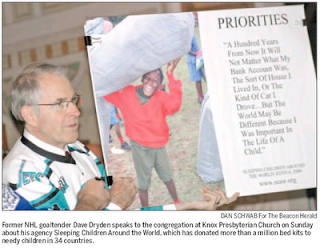 Sleeping Children Around the World: Dave Dryden thanks Knox congregation. Former NHLer Dave Dryden recalls that when he was growing up his father was adamant that his two sons get enough sleep every night. "He would always say, 'Dave, have you got a game tomorrow? Get a good night's sleep. Ken, got an exam tomorrow? Get a good night's sleep,'" says Dryden, who is the brother of Hall of Fame goaltender Ken Dryden. "He used to drive us crazy," Dryden says. "But as we grew older, we appreciated the fact that sleep is huge in a child's life. Physically, mentally, to be ready to face challenges, you need to be rested." Dryden, a former goaltender with the Edmonton Oilers and Buffalo Sabres, spread his father's message about the importance of children getting enough sleep during an address to the congregation at Knox Presbyterian Church Jan. 31. Dryden's father Murray founded the Sleeping Children Around the World (SCAW) organization in 1970, when he gave out 50 bed kits to needy children in India. Since then, SCAW has sent more than one million bed kits to children in 34 countries. A donation of $35 covers the cost of a bed kit, which includes a mattress, bed sheet, blanket, pillow, mosquito net, pyjamas and school supplies. 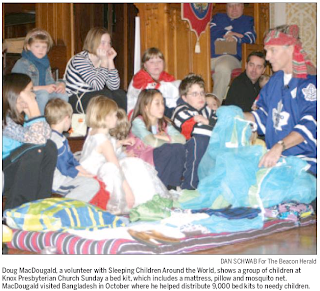 Knox Presbyterian Church began its relationship with SCAW when Murray first made a request for donations there in 1990. Last year, the church donated $2,500 to the organization. On Sunday, they presented Dryden with a cheque for $700. "Twenty years ago my dad was standing right here speaking to you," Dryden said from the podium at the front of the church, as some of the children of the congregation laid face down in the middle of the aisles pretending to sleep, raising awareness about how alarming it can be to see a child trying to sleep without a bed. "It's such a great feeling to feel the passion in this sanctuary from all the efforts of the people in Stratford who have put this on," Dryden said. Dryden noted that while SCAW is working to help children around the world, they currently are not able to send donations to victims of the earthquake in Haiti. "We have been to Haiti before. In the early 1980s we distributed bed kits there," Dryden says. "The problem was that it became a very unsafe country for our volunteers to go into, so we had to leave Haiti. Over the last few years we have tried to find ways of getting back there." SCAW doesn't ship the bed kits from Canada but instead uses the donations to develop cottage industries within the countries where the bed kits are distributed. Dryden says SCAW's contacts in Haiti have told the organization that since the earthquake destroyed so much of the country's infrastructure, it would be impossible to find a company to manufacture the bed kits at this time. "We'll go in after order has been restored," Dryden says. "But we certainly promise people that as soon as the emergency is over, we'll be there." SCAW is currently working in nine countries around the world. To donate, visit www.scaw.org. "It's such a great feeling to feel the passion in this sanctuary from all the efforts of the people in Stratford who have put this on."